Considering how long stylish travelers have had to cart around less-than-beautiful electrical doohickeys, it’s a wonder that fashion hasn’t come to the rescue sooner. 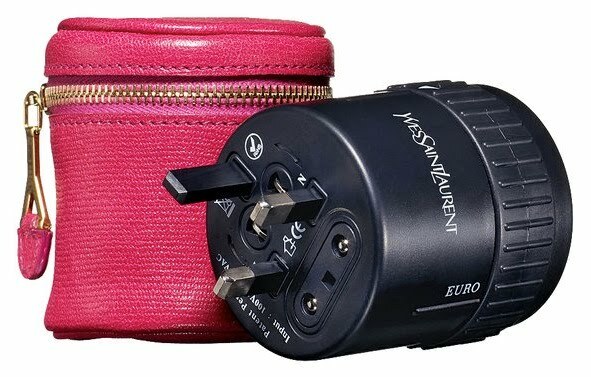 The Yves Saint Laurent travel adapter ($450) is a one-piece electrical dual-voltage plug adapter that connects gadget to outlet in any combination in more than 150 countries (Japanese cellphone to American outlet, German shaver to Australian socket). The circular device swivels to each region’s plug, and a leather bag available in fuchsia, black and violet provides the panache. weelavett!!! weewannett!!! but at US$450?? hmmm the things you can buy with that amount! if you had US$450, what would YOU buy? Why would YSL make something like this? Products like this is how brands deteriorate as a brand. Whoever approved to have this made should be fired. Almost reminds me of Gucci in the early 80s when they started making tennis rackets, golf balls and other junk. Beginning of the end I thought at that time. and I was right.